Photo of the day: MODERN DAY MARILYN – The Marilyn-esque look will last forever. I was strolling through the east village and came across MM staring down at me through the window of the wonderful 125 Second Avenue vintage shop “ENZ’S”. 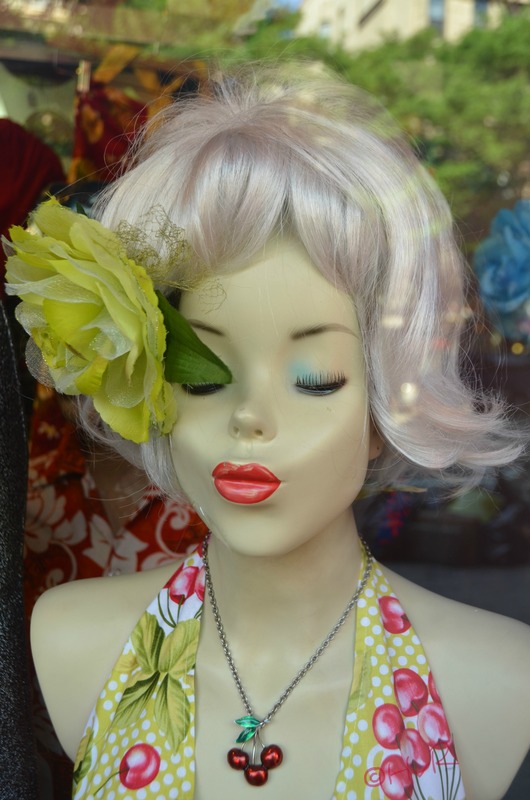 This mannequin has so many MM references: the cherries from her ‘The Misfits’ dress, the halter top from the famous subway skirt blowing scene in ‘The 7 Year Itch’, the pouting lips, the droopy eyes and lashes, the famous flip hairdo with an updated color – it’s Marilyn! The east village is one of the last vestiges of what the entire “village” used to be like. Odd, unusual shops filled with quirky items, retro and hand made looks and even quirkier shop owners. Sadly in the Bloomberg/Quinn era the flavor of our ‘originality’ is quickly disappearing in favor of high rent chain stores and the ever cancerous growth of the New York University (NYU) campus. I truly hope in 2025 I will still be able too wander along some of our streets and find a Marilyn pouting at me through the window of a funky shop. This entry was posted on July 13, 2013 by newyorkcityinthewitofaneye. It was filed under DAILY PHOTOS WITH STORIES OF NEW YORK CITY and was tagged with 'The 7 Year Itch', 'The Misfits', 1950's shop, anti Blomberg, anti NYU, anti Quinn, clothing, East Village, gentrification of neighborhood, Greenwich Village, Hans Von Rittern, Manhattan, Marilyn Monroe, Marilyn Monroe bust, Marilyn Monroe mannequin, New York City, New York photo, nyu campus, NYU takeover, Photo of the day, retro shops, Second Avenue, second hand shops, shopping, style, thrift shops.